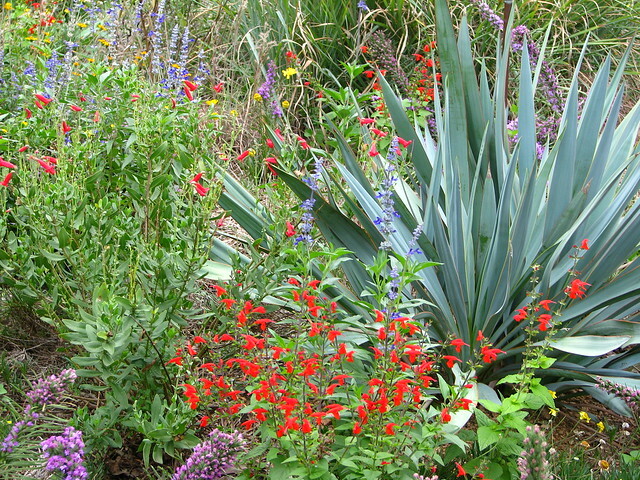 October 14-20, 2012 is Texas Native Plant Week and I just happen to have a few Texas natives growing in my garden. I try to focus on plants that are native to this immediate area, like the Snow on the Prairie, Euphorbia bicolor, and Mealycup Sage, Salvia farinacea, above. 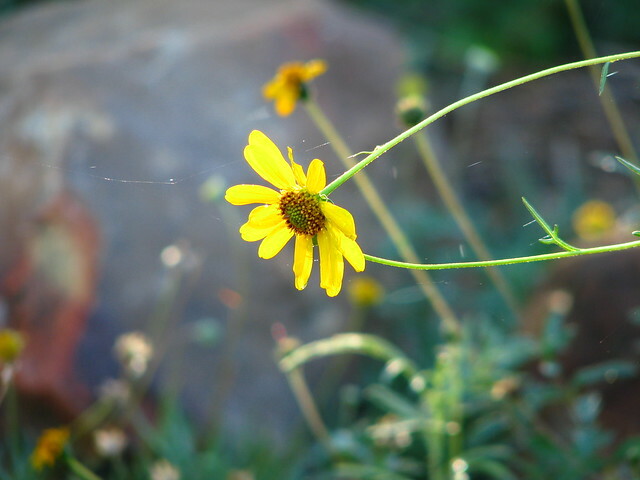 It is good to know what part of the state a native plant grows wild. 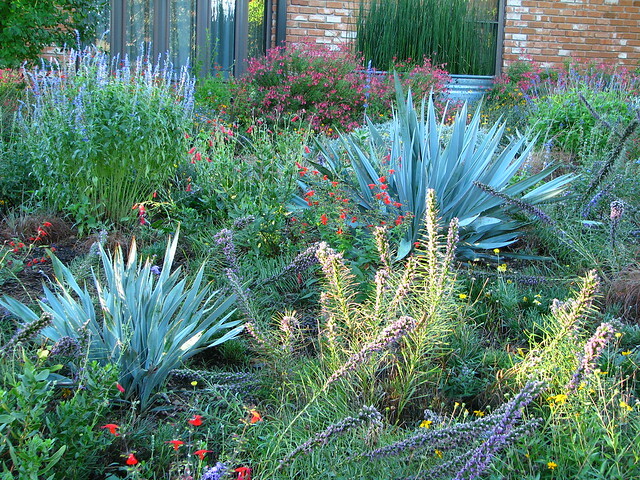 Just because a plant is native to Texas does not mean it will grow and thrive anywhere in Texas. Texas is a big state and the climate and soil type can vary greatly. 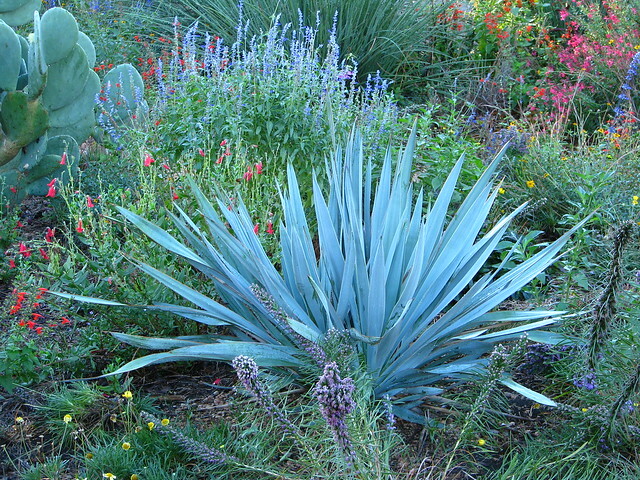 A plant that is native to Houston may not survive in El Paso or Plano and vice versa. 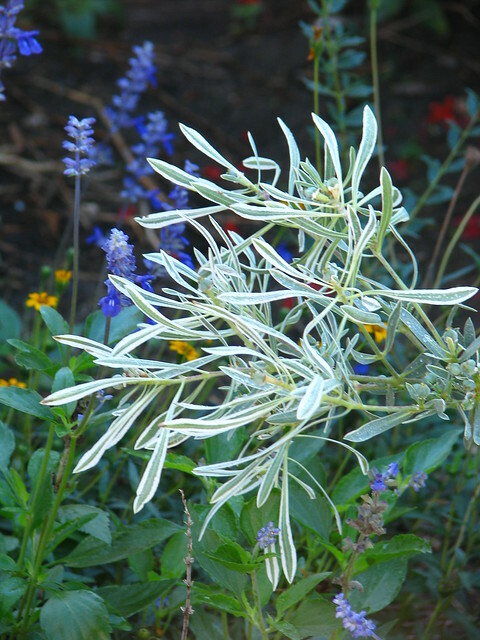 The North American Plant Atlas on the Biota of North America Program's website is a great resource for determining where a plant grows naturally. And you can get this information down to the county level. I was surprised that almost every native plant I looked up was mapped. Sometimes there are microclimates and soil variations on your own property that can mean the difference between a thriving plant and a struggling plant. For example, Pale-Leaf Yucca, Yucca pallida, is native to this area of the Blackland Prairie. The two plants above, were purchased and planted at the same time. The plant on the left is a little lower on a slope than the plant on the right. The plant on the left is smaller and looks yellow coming out of the wet winter months. I dug up the plant on the left last spring because I suspected poor drainage could be the issue. I found several rotted roots so I added more decomposed granite to the soil in hopes of improving the drainage. These plants are only three feet apart, but the condition of the soil makes a significant difference in the health of the plants. This is a close up of the thriving plant on the right. The pale blue color is amazing. 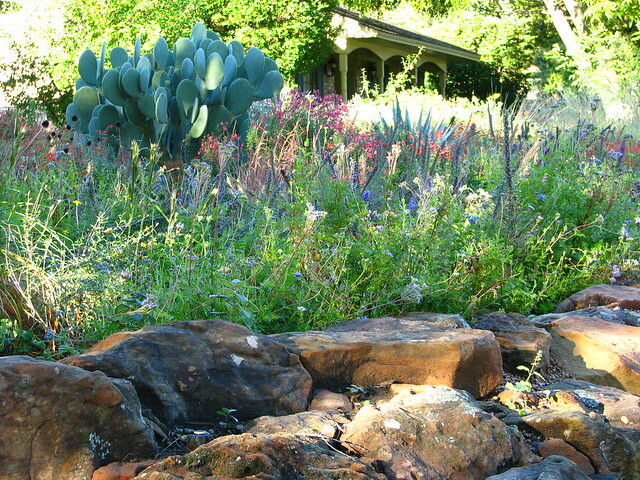 At the lowest end of the front garden, I added a rain garden that holds water for a few hours after a rain. 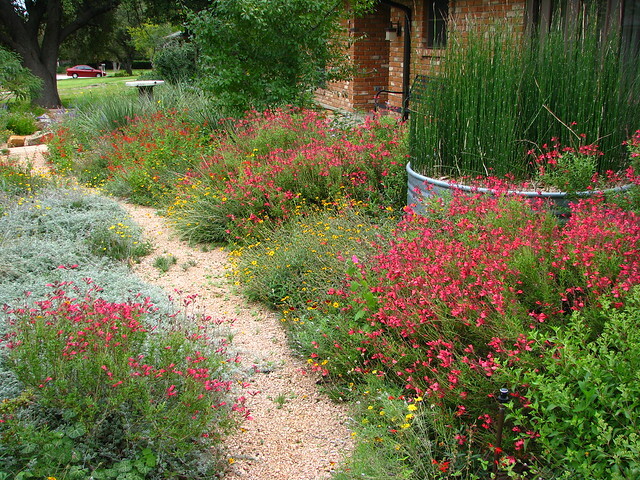 I am still experimenting with native plants that can take short periods of soggy soil and extended periods of dry soil. 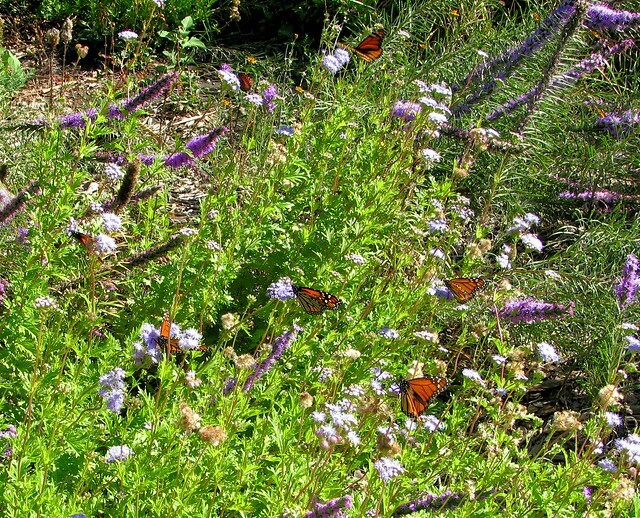 After almost four years, native plants like Gregg's Mistflower, Conoclinium greggii, False Indigo, Amorpha fruticosa, Gayfeather, Liatris sp., and even Heartleaf Skullcap, Scutellaria ovata, are performing well under these conditions. Skeleton-leaf Goldeneye, Viguiera stenoloba, grows in a patch of sandy fill dirt that somebody placed over the native Blackland clay at some point in the 39 year history of my home. 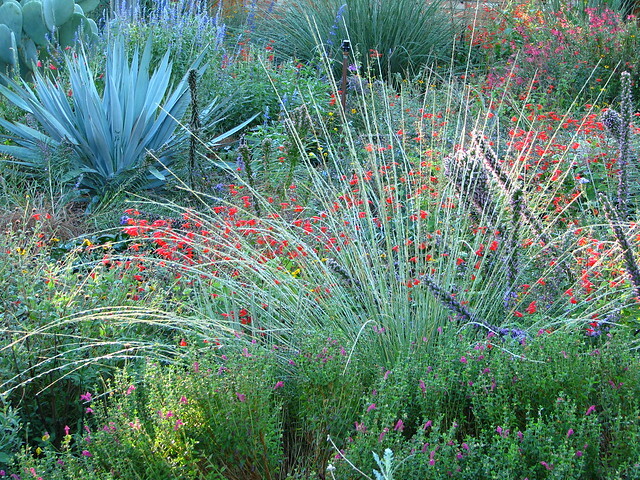 There are native plants for every location and condition. It just might take a little research or trial an error to find the right plants. I happen to use both methods. 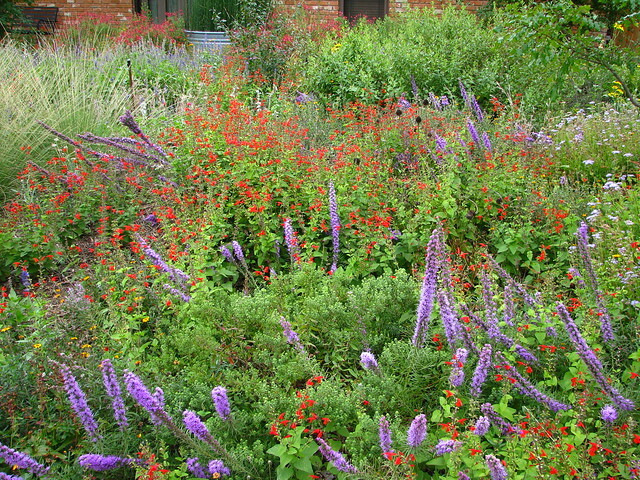 Why native plants? Watch this short video (not mine) to find out why. The cool temperatures and cloudy skies over the weekend seemed to bring out the colors in the garden and the dominant colors right now are shades of red and purple. This color combination was not planned. It just seemed to happen on its own. 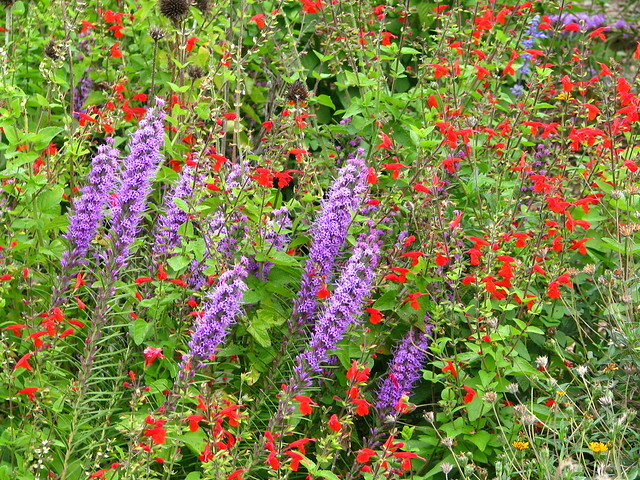 I planted the Gayfeather, Liatris, in the front garden, but I had Scarlet Sage, Salvia coccinea, in the back garden and did not intend to have more in the front garden. A few plants found their way to the front garden some how and began to spread. The Liatris spread too. I scattered seeds from two plants that I had in the garden and I think every one of the seeds sprouted. In a couple of weeks, there will be more purple in the garden when the Aromatic Aster, Symphyotrichum oblongifolium, in the lower center of this photo begins to bloom. 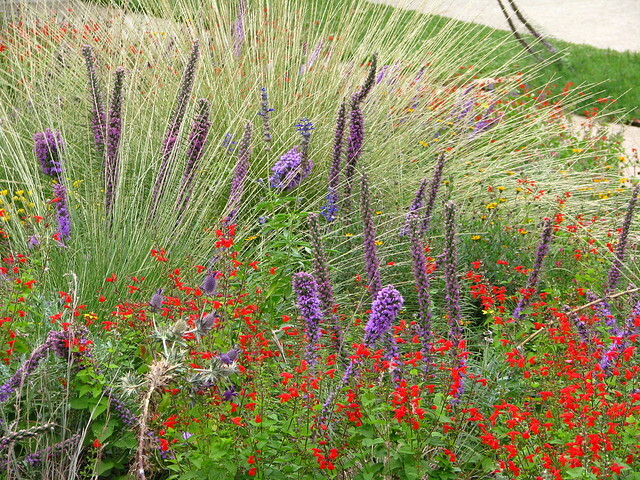 Scarlet Sage, Liatris, Mealycup Sage, Salvia farinacea, and Eryngo, Eryngium leavenworthii, grow among the Pine Muhly grass, Muhlenbergia dubia. 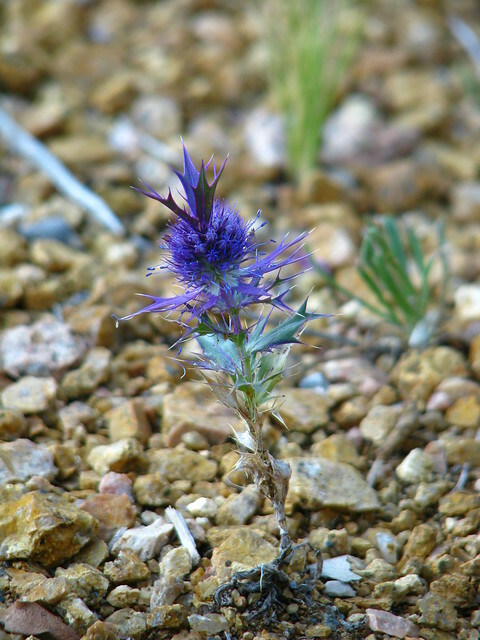 The spiny purple flowers of Eryngo are beginning to fade and go to seed now, but look at this cute little one that grew in the decomposed granite between the sidewalk and street. Adding to the red color scheme is Rock Penstemon, Penstemon baccharifolius, to the left of the Pale-leaf Yucca, Yucca pallida. 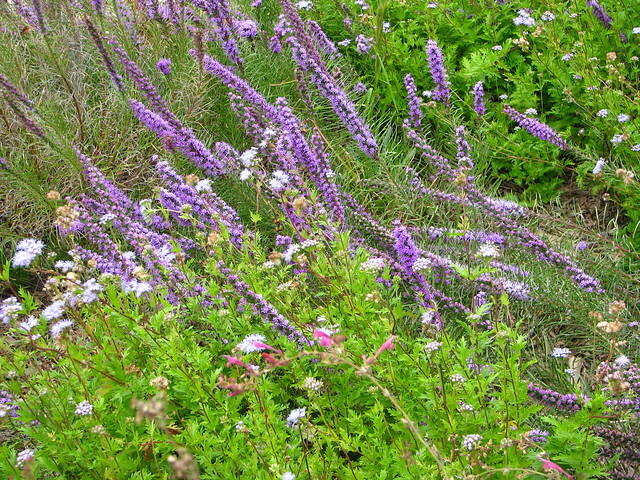 The Autumn Sage, Salvia greggii, on the right side of the pathway blooms heavily in the spring, sporadically during the summer, and then heavily again in the fall. It is a favorite of hummingbirds. 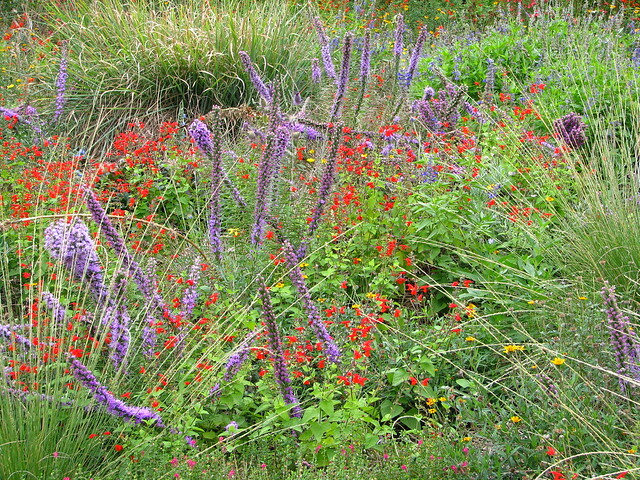 Liatris grows among the Gregg's Mistflower, Conoclinium greggii, in the rain garden. Gregg's Mistflower is also known as Blue Mistflower. The flowers are bluish purple and are a favorite of monarch and queen butterflies. In fact, all of the flowers mentioned above are popular with butterflies and bees. Saturday and Sunday were too cool for the butterflies to come out. 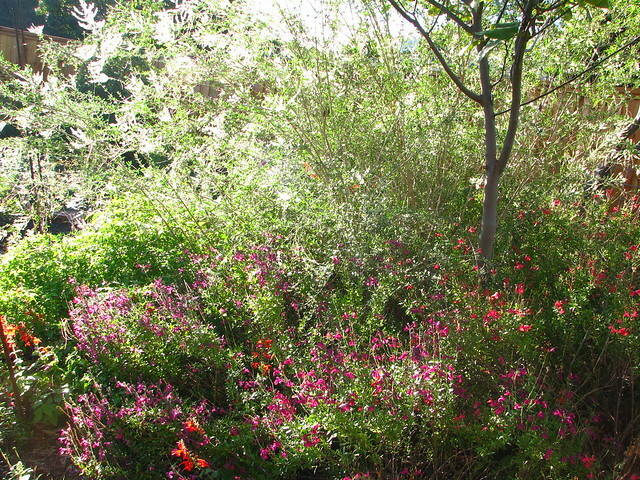 As soon as the sun came out on Monday and temperatures warmed, butterflies and bees filled the garden. There are at least six monarchs and one queen butterfly in this photo. The red and purple flowers in the garden will provide a welcome pit stop for the orange and black monarchs as they make their way to Mexico for the winter in the coming days.